Does “low-carb” have an official definition? Low carb dieting seems pretty simple at first: just eat fewer carbs. But fewer than … what? There are three carb cutoffs that researchers use to define “low-carb”, plus a fourth option that involves carb timing. Let’s quickly see what those are. Once you go below 50 grams of carbs a day, most studies classify that as a Very Low Carbohydrate Ketogenic Diet (VLCKD). You’ll see the overlapping term “VLC” thrown around more frequently on websites than “VLCKD”. When you think of the Atkins Diet, or even medical diets based on Atkins, they fall under this category. This carb level is supposed to lead to extra fat loss magic, which has been mostly disproved by recent experiments. Regardless, the lower you go below 50 grams of carbs, the more ketones you produce. And for some conditions (especially epilepsy), ketones could be beneficial. Other people just feel better eating VLC diets. Eating less than 50 grams of carbs guarantees you admission to the low-carb club. Even your body knows about this club membership, since your liver is forced to make ketones in order to preserve glucose. Your liver stores carbohydrate in the form of glycogen, maxing out at around 150 grams of stored carbs. 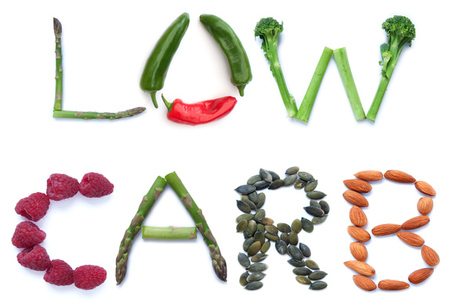 If you fast for a day or two, or just eat very low carb intakes, that’ll exhaust your liver’s glycogen stores. This is also roughly the maximum carb intake that real life low-carbers would consider “low-carb”. And it would come with a qualification like “yeah, I eat fairly low carb”. Anecdotally, when people eat below 100-120 grams of carbs a day, some of them feel really crappy. The reasons for this can vary by person. Some simply crave more carbs and are dissatisfied with what’s going into their bellies. Also, our intestines can be finicky, leading to altered bowel habits and altered microbiomes even after just a day of carb changes. And since neurotransmitters abound in that area (such as the 90% of your body’s serotonin that’s produced in the gut), your brain can be impacted by what impacts your gut. If you eat somewhere between 100-150 grams of carbs, you’re way lower than average, and your body is quickly burning through its liver carb stores. If you eat extra protein, that can provide a buffer to replenish these stores. The average American eats a little over 300 grams of carbs a day. So if you instead eat a little over 200 grams of carbs a day, you might not be welcome at your local low-carb meetup, but you are definitely firmly in the lower-carb end of things -- slashing carb intake by almost half. This carb level can be a nice middle-of-the-road intake, especially since it doesn’t seem to impair muscle performance. Then again, it doesn’t appear to provide the metabolic benefits of lower carb intakes in overweight people with diabetes. Absolutely nobody would call this a low-carb diet. But it’s lower than what most people eat, and is easily sustainable for almost everyone. Everyone you know has actually tried a low-carb diet before. That’s because everyone’s low-carb between meals! Most people are only low-carb for around ten hours: eight hours of sleep plus a couple more hours. Others are low-carb for many years. But there’s actually a standardized low-carb diet that falls between those extremes. Its called the cyclical ketogenic diet (CKD), which basically involves low-carb weekdays and carb refeeds on the weekend. This diet is especially beneficial for athletes or those interested in fine tuning body composition, since you can drastically lower calories for most of the week then fuel exercise with carbs for a day or two. CKD is just one form of intermittent carbohydrate restriction, which has shown benefits in a few trials. There’s one other way you can restrict carbs, by only eating carbs around workout time (TKD, or targeted ketogenic diet). All of these diets are ways to play around with energy restriction based on timing, with the most popular form being intermittent fasting. You can modify carb intake in creative ways other than just eating less every day. For example, eating less on certain days, not eating much carb when you’re not working out much, or just fasting for a large portion of the day. There is no standard definition of low-carb, and hence everybody and their mother and their health guru has their own definition. The only definitions that matter are those that your body understands, such as the level that depletes liver glycogen, or the level that reliably produces ketones, or most importantly the level where you still enjoy eating but also doesn’t make you gain too much extra weight.